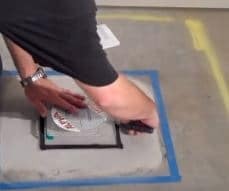 Concrete moisture and vapor tests are conducted to examine the presence and quantity of moisture in concrete floors and slabs. This is because moisture in concrete cause several problems for instance, discoloration, interrupt polymerization of products, and lead to delamination of bonded coating systems. Therefore, it is required to check the presence of moisture in concrete slabs and floors and implement necessary measures to eliminate it or restrict its detrimental influence. There are several methods which are used to measure moisture qualitatively and quantitatively. 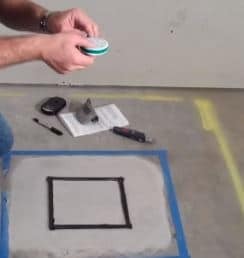 Plastic sheet test (ASTM D 4263) and calcium chloride test (ASTM F 1869) are used to measure concrete moisture and vapor. The former provides qualitative measure whereas the latter gives quantitative result. 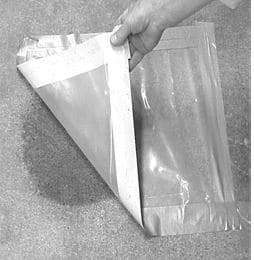 Plastic sheet testing method used to indicate the presence of moisture in concrete. So, it is suitable for the case where the application of coatings for concrete surface is planned. The test shall be conducted prior to the use of coating. Transparent square polyethylene sheet (460 mm x 460 mm) and thickness of 0.10 mm. 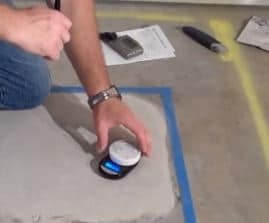 For concrete floors, walls, and ceilings, one test per 46-meter square shall be conducted. The recommended practice is minimum of one test for each 3m of vertical rise in all elevation starting within 300 mm of the floor. 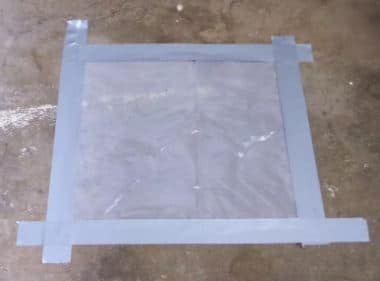 Tape the sheet tightly with the tape on concrete surface, and ensure that all edges are properly sealed, Fig.1. Leave plastic sheet at its place for minimum sixteen hours. Then, remove plastic sheet, Fig. 2. Wipe a finger on concrete and underside sheet to feel any moisture. Moisture on the concrete surface causes the surface to feel cooler, and results in a darker surface color. Leaving the sheet in place for 16 hours does not provide enough time for the test to reflect results of moisture movement from the bottom to the top of the slab. Thus, it indicates only what is happening at the surface. Moisture under the plastic sheet may be more related to moisture condensation due to the slab surface being at the dew-point temperature rather than being related to moisture flow. 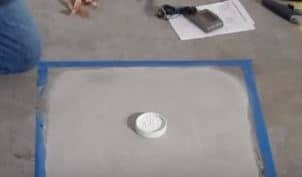 According to ASTM F 1969, calcium chloride test method measures the rate of moisture vapor emitted from below-grade, on grade, and above-grade bare concrete floors. 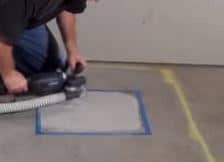 It is used to obtain a quantitative value indicating the rate of moisture vapor emission from the surface of a concrete floor and whether or not that floor is acceptable to receive resilient floor covering. A plastic dish (69 mm diameter, 15-20mm height) containing 16 g of anhydrous calcium chloride, covered with a lid that can be sealed around the circumference with pressure-sensitive tape. Transparent Cover (38mm height) with 12 mm flanges around the perimeter is required to seal the test area of the floor. Scale, capable of measuring 0.1 g.
Three test locations for areas up to 100-meter square. Add one additional test for each 100-meter square or fraction thereof. Prepared concrete surface by abrasive cleaning to remove all foreign substances. Then, weigh the dish, calcium chloride, lid, and tape to the nearest 0.1 g.
Record the starting weight, time, date, test location. After that, open the dish and place it on the prepared concrete surface. Place the plastic cover over the dish and fasten it to the concrete surface using the preformed sealant tape attached to the flanges. After 60 to 72 hours, cut a hole in the plastic cover, and remove the dish. Then, replace the lid which is attached with the pressure-sensitive tape, and weigh the sealed dish again. T: exposure time in hours. The ACI 302.2 R-06 cited other types of concrete moisture tests apart from those discussed above. For instance, Relative humidity test (ASTM F 2170 and F 2420), Electrical resistance test (No ASTM standard test method), Electrical impedance test (No ASTM standard test method), Mat test (No ASTM standard test method), Qualitative calcium chloride test (No ASTM standard test method), and Primer or adhesive strip test (No ASTM standard test method).